You don’t have to spend a fortune on your Disney resort to still get the magic that Disney resorts are known for. 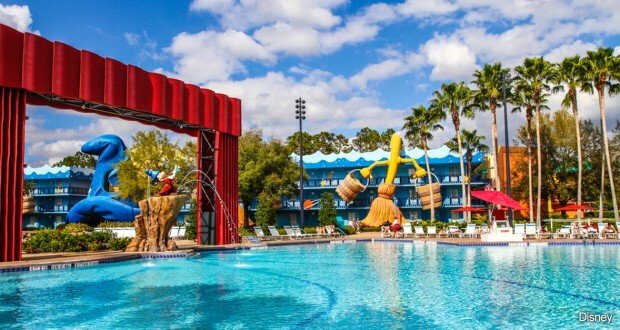 The All-Star Movies resort is a value resort on property and it is has some great reasons to make this your choice hotel if you are on a budget or want to just enjoy the theme of some of Disney’s favorite movies. Here are a few reasons why All-Star Movies is an awesome choice. 6. Larger than life – Just driving up to the All Star Movies resort is a fun of its own. The decorations that are used to separate each section of the resort into different movie themes are so large and detailed, you can’t help but want to tour the resort to catch a glimpse of them all. Head over to the Toy Story section and sit on some wooden blocks the size of a VW beetle. The Fantasia section has a Sorcerer Mickey themed pool and several of the characters from the film throughout the resort buildings. If you love 101 Dalmatians, you won’t want to miss the 2 story puppies at each building or the giant red fire hydrants. The themes don’t stop at the decorations outside, but also are part of the sidewalks, room décor and green space outside each building. 5. Food, food, food – One of the best things about the All Star Movies resort is the World Premiere Food Court. We have stayed at many Disney resorts and we always say this is one of the best food courts around. The reason is simple, selections. There is 5 different food court lines where you can pick anything to eat from pizza and pasta to hamburgers and grilled dishes. They also serve ice cream and baked goods all day until midnight. If you don’t feel like going out, don’t forget you can also have pizza delivered to your room. 4. Fantastic Fantasmic Pool – After a day in the park, nothing is better than relaxing pool side with your favorite sorcerer mouse. The main pool at the All Star Movies is a great place to cool off and recharge. Mickey is the center piece of the pool while shooting out water at swimmers nearby. There is also a kiddie area for the smaller swimmers. There is also a smaller, but no less themed “Mighty Ducks” pool in another part of the resort. Don’t forget to stop by the pool bar to grab a delicious Disney cocktail to enjoy. 3. Hotel fun – If you are spending some down time at your hotel and want some more exercise, there is great 1 mile trail that connects to all the All Star resorts. If you have time, it’s fun to go look at all the different All Star themes the way only Disney can do them. They also have an arcade and playground that is sure to keep your little ones busy while you catch your breath. 2. Movie night… poolside – If you find yourself at the hotel with no plans, then check the resort calendar of events and see when they are showing a Disney movie out at the pool. It really is a nice way to spend an evening under the stars. Most Disney resorts do this regularly, so just check to see what the movie is and then head out to the Fantasmic pool for family fun. 1. Kid-friendly – One of the things we liked best about staying at this resort when our kids were younger was how relaxed and kid-friendly it was. There was no need to constantly tell your child to shh… because the walk to your room is meant to be fun. They can climb and pose with some of their favorite giant movie characters, run around a life size checker set or even a hockey puck. This is a great place to be with small kids who need a little room to run around when not standing in lines. There are lots of choices when staying at a Disney resort, but if you have a budget in mind, then you will want to give All Star Movies a try. It has all the special Disney touches like free shuttle services to the parks, shopping delivery services to your resort from the parks, and extra magic hours without the break the bank cost of some of the more expensive Disney resorts. Discover more about Disney’s All Star Movies Resort by planning and booking your next Disney trip with an Authorized Disney Vacation Planner you can trust like Mickey Travels. They’ll help you get the best price for your vacation, share expert advice and their services are totally FREE! It’s genius!